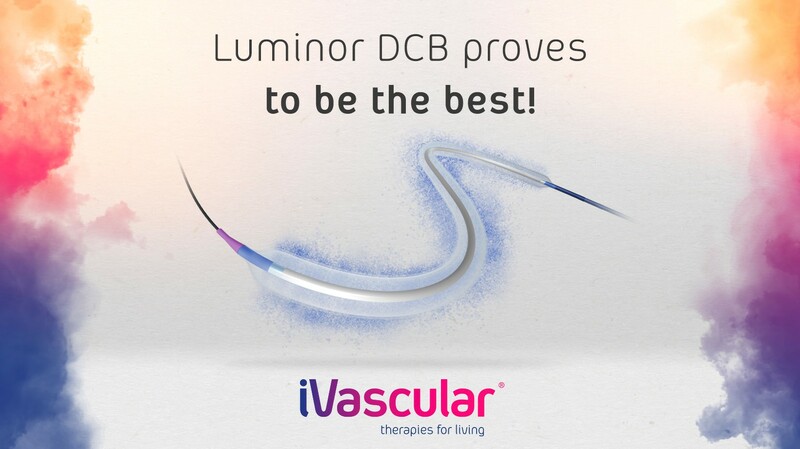 iVascular Luminor DCB proves to be the best! Barcelona, February 14th, 2018 – iVascular Luminor DCB proves to be the best! The EFFPAC 6-month results have been presented by Prof. Dierk Scheinert (Park-Krankenhaus Leipzig, Germany) at the opening of the LINC 2018 main session dedicated to latest results with new technologies for femoropopliteal obstructions. EFFPAC is a Randomized Controlled Study comparing the Luminor DCB versus POBA in femoropopliteal lesions. Primary and secondary endpoints were achieved with high statistical significance. Primary endpoint revealed a late lumen loss of 0.14mm in the DCB group vs 1.06mm in the POBA group (p<0.001). Target Lesions Revascularization was 1.3% (DCB) vs 17.1% (POBA) (p<0.001). Primary Patency (PP) was 94.7% (DCB) vs 75.0% (POBA) (p<0.001). Rutherford stages were overall improved for 85.2% patients (DCB) vs 75.0% (POBA) (p=0.021), and by 3 stages for 44.6% patients (DCB) vs 27.8%. “We were convinced that Luminor was the best DCB due to its advanced coating technology. With the EFFPAC-RCT results, it is now demonstrated” -said Lluis Duocastella, CEO of iVascular. Luminor is a paclitaxel coated balloon with an innovative and proprietary coating, using unique nanotechnology for minimized drug loss during navigation and enhanced delivery to the artery wall. Full range is available with 0.014”, 0.018” and 0.035” guidewire compatibility, providing ultra-low profile and fast deflation time.